What was once a single desktop app with a confined feature set, is now 2 separate software entities, each with specific, often overlapping functionality. The worst part is the naming convention – if you’re confused about the difference between Lightroom Classic CC and Lightroom CC, you’re definitely not the only one!! In this guide, I want to explain the benefits of Lightroom CC, and why it’s such a powerful tool for both amateurs and professional photographers alike. I’ve also added some bonus tips on editing with Lightroom CC, importing presets and using the Lr CC camera. 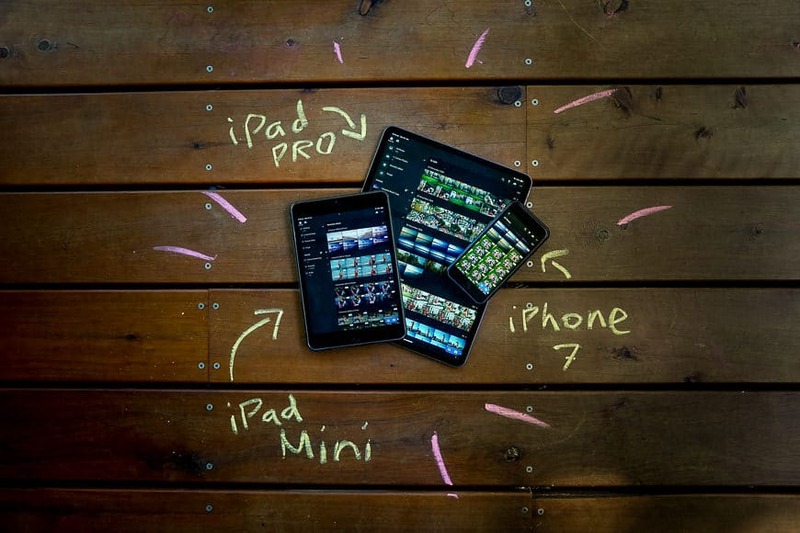 What is Lightroom CC for Mobile? The confusion of Lightroom CC ‘for mobile’ stems from the fact that it’s also a (desktop) computer app. In a nutshell, Adobe Lightroom Classic CC is the offline version and Lightroom CC (mobile) is the online version… and it’s also an App for your phone/tablet. Things start to get more confusing when you subscribe to an Adobe CC plan and both versions of Lr are downloaded to your computer. One way of thinking about it is that Lightroom CC is not really ‘on your computer’ – it’s more like a ‘web app’, that is displayed on your computer like a web page. To keep this guide to Lightroom CC concise, I’ll answer all the confusion surrounding the various versions of Lightroom first. It’s important that you understand the difference between Lightroom Classic CC and Lightroom CC, in order to understand why using Lightroom CC in your everyday photography workflow is such a revelation. What is the difference between Adobe Lightroom CC and Lightroom Classic CC? Adobe Lightroom Classic CC is the offline version, i.e. the one you use on your computer. Lightroom CC (mobile) is the online version, i.e. the one you can also use on your phone and tablet. When you subscribe to one of the Adobe Creative Cloud plans that include Lightroom (explained here), you download both versions of Lightroom to your computer. You can download Lightroom CC for free to your mobile device at any time (subscribed or not), but the functionality is limited. What are the differences in features between Adobe Lightroom CC & Lightroom Classic CC? Interface and modules – CC: one single window; CCC: various modules. Keywords – slightly different keywording in both apps. CC has Sensei too. What is the difference between Lightroom CC and Lightroom Mobile? None – they’re the same thing. Calling it ‘Lightroom Mobile’ is easier to understand for some people who only use Lightroom on their mobile phone or tablet. 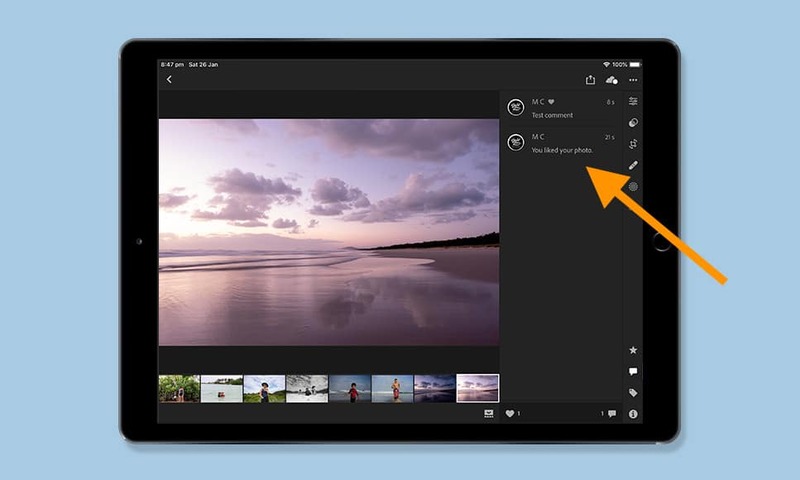 However, strictly speaking, you can use Lightroom Mobile (aka Lightroom CC) on your desktop/laptop computer too – it’s just that all the images are actually being stored/edited via Adobe’s cloud. To add to the confusion, Adobe sometimes refers to it as ‘Lightroom CC for mobile’. Yes and no. It’s free to download onto a mobile device as an app (just called ‘Lightroom’), but the functionality is limited. In order to download it to your computer, you need to be an Adobe Creative Cloud subscriber, like on the Photography Plan, which is what I use. What features are missing from the free version of Lightroom CC? There are certain ‘premium features’ that aren’t included in the free version of Lightroom CC that you have on your mobile phone or tablet. For many photographers, paying for an Adobe subscription is worth it for the features above alone. Being able to import RAW files directly from your camera to your tablet, then use all the powerful editing tools available to you on the desktop version of Lightroom (just using your finger or a stylus), is incredibly liberating. 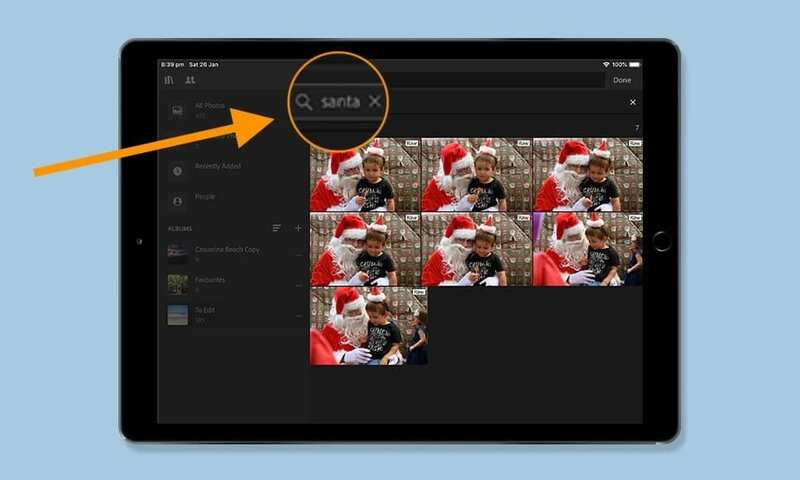 The Adobe Sensei search functionality is mind-blowing too, and will continue to improve. How much does Lightroom Classic CC cost? How can I get Adobe Lightroom Classic CC for free? You can download Lightroom to trial for 7 days, for free (click here to do so). After that, you need to pay each month for a subscription to use it. I hope that clears up a lot of the confusion surrounding this amazing piece of software. It’s unfortunate that Adobe makes things so complicated for us, but regardless, let’s get stuck in to the rest of the guide! 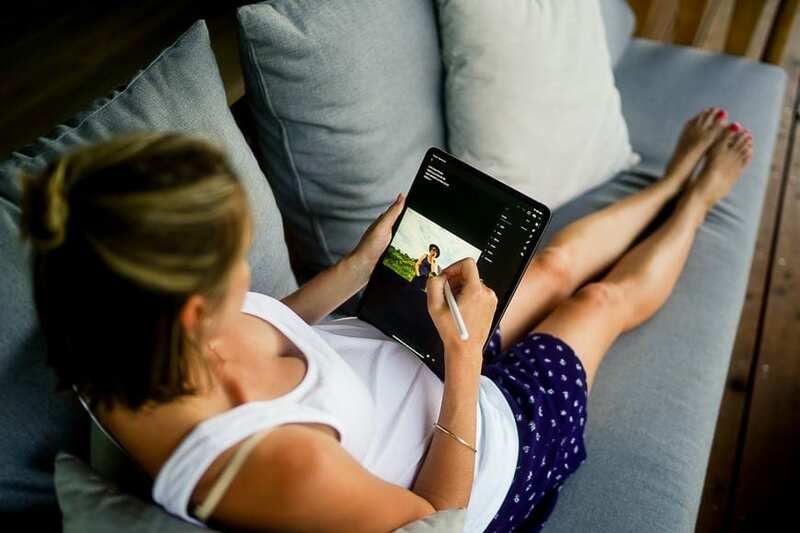 Editing images using Lightroom CC on an iPad on the sofa – perfect for my pregnant wife! This one’s easy – everyone should be taking advantages of Lightroom CC – beginners, amateurs, pros. All of you! To take full advantage of Lightroom you need to pay a monthly subscription, but hopefully by the end of this guide, you’ll understand why the subscription is so worthwhile for every photographer. Lightroom as both an online and an offline software is truly groundbreaking – everyone who owns a camera should take advantage. Initially I was annoyed to be forced to pay each month for an Adobe subscription, especially after owning the standalone version of Lightroom 6 (still available here). Lightroom CC features Premium Features, which are unlocked when you subscribe. Something that Adobe doesn’t make very clear is why anyone would want to pay for Lightroom CC. As a free app for your phone or tablet (named simply ‘Lightroom’), it does a great job as a photo editor and camera. However, many people don’t realise that there are actually 8 premium features which are ‘unlocked’ when you become a Creative Cloud subscriber. The 8 most useful features of Lightroom CC are only available to subscribers. The power of these features alone make the subscription fee worth it. Adobe calls these ‘Premium Features’, and they really do make Lightroom CC 10x more powerful. 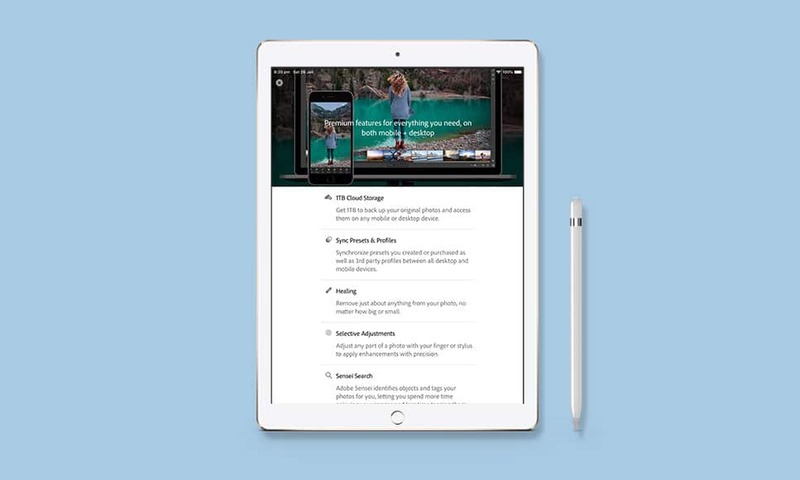 Cloud storage syncs edits across devices, including selections made when culling on a tablet or phone. 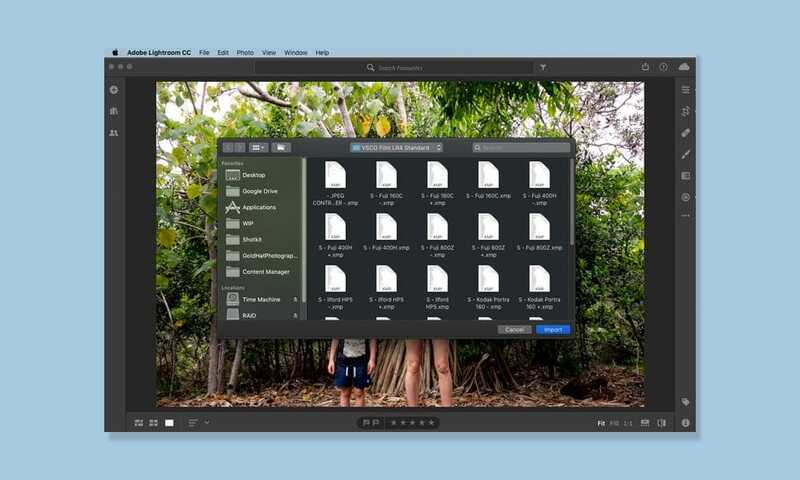 This is the key benefit to Lightroom CC – having up to 1TB of online storage with Adobe can literally transform your workflow, whether you’re a beginner, amateur or pro photographer. Once you’ve decided which photos you want synced to the Adobe cloud (you can do this inside Lightroom Classic CC or from within Lightroom CC), all your photos and edits are backed up from accidental erasure. More excitingly, all your photos are editable on all of your mobile devices, with edits being kept in sync across them all. You can start culling images on your main computer, then hop onto a bus with your tablet to do some quick edits, then get to work and share the images via your phone. When you get home, all the edits will be waiting there on your computer, almost like you’ve been working on that computer all along! The first time you try this, it’s truly mind-blowing. Syncs happen fast over Wifi or 4g, and file transfers are kept small thanks to Lightroom’s ingenious Smart Previews. Trust me, this one’s a game-changer. Being able to edit photos on a plane, on your sofa, on the toilet…(!) is a truly liberating experience, and makes the process a lot more fun to boot. Editing RAW files in Lightroom CC enables maximum dynamic range when editing. Another huge benefit of paying monthly for a Lightroom subscription is the ability to import and edit RAW files on your mobile or tablet. 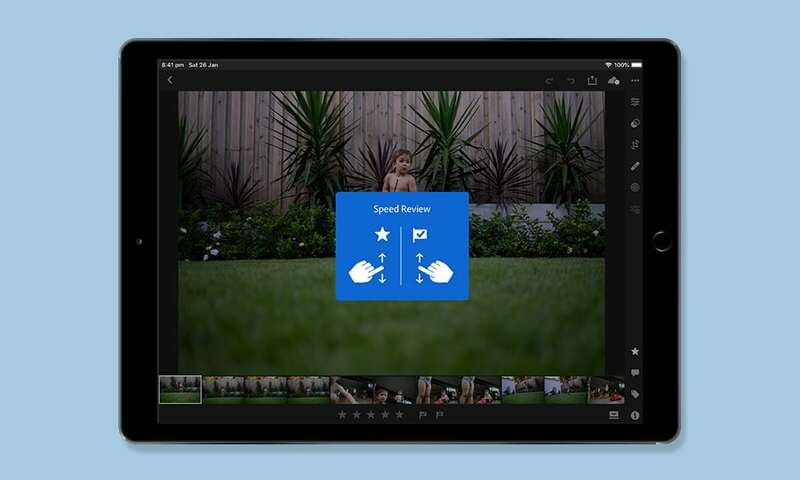 This is something many photographers have always dreamed about – a truly mobile workflow, whereby you can import RAW images from your camera direct to your tablet or phone, then edit and finally share them… without touching a computer! These are wonderful times we are living in as photographers! Lightroom CC allows us to take advantage of a truly mobile workflow, that’s affordable, simple and fun. Importing RAWs from a camera is a cinch – you just need either a card reader specific to your tablet (like this one for an iPhone or iPad), or a camera that supports a USB-C connection (like the Sony a7III). Once they’re on your mobile device, Lightroom CC works its magic to make them ridiculously fast to load and edit – way faster than any computer I’ve used. You can even choose to sync the RAWs over the cloud, back to your main computer. 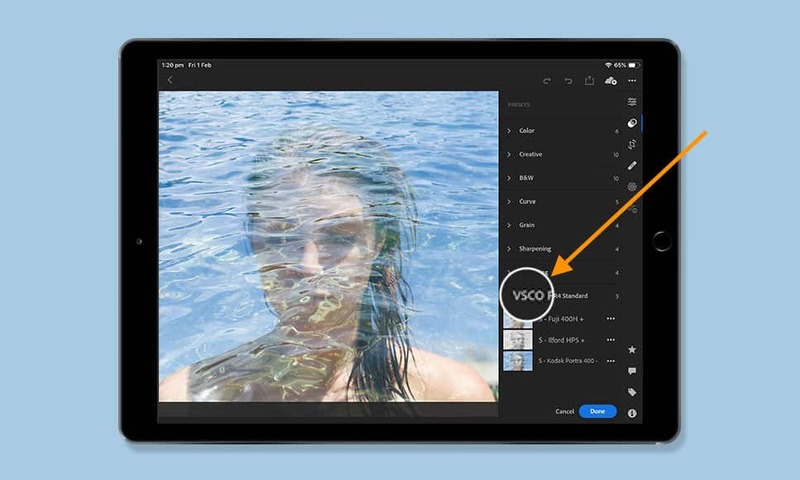 Syncing presets in Lightroom CC is simple – even ones you’ve purchased, like VSCO. You’re now able to sync across any of the presets in your main Lightroom Classic CC catalog to any of your mobile devices – presets you’ve purchased, downloaded, or made yourself. You’re even able to create your own presets on your mobile device in Lightroom CC, and have those sync back to your main computer! Removing distractions with one tap/drag of the finger is a powerful feature. Lightroom’s healing brush is the easiest way to get rid of unwanted elements in your photos – one click, or a click and drag, and the offending element disappears. 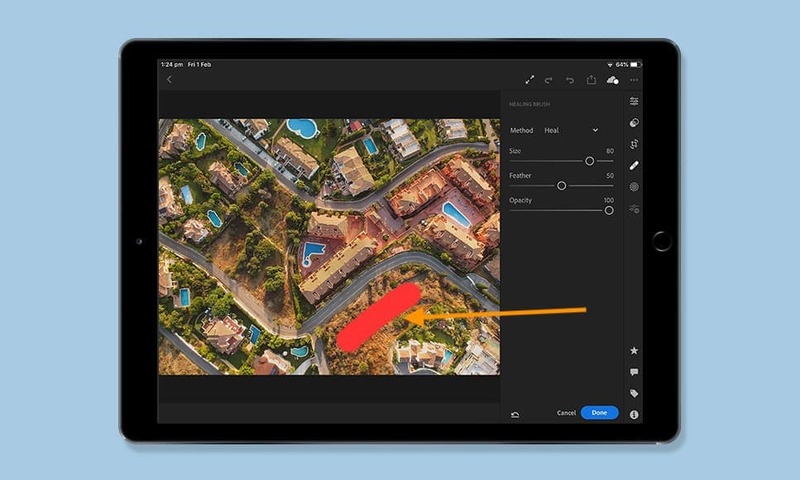 Having the healing brush on your mobile device is great – you just tap your finger over the thing you want removed, and Lightroom CC does the rest in a second. I use this tool a lot on my main computer, so it’s great to have it on my tablet too. The Gradient Tool is a simple way to selectively adjust an image. 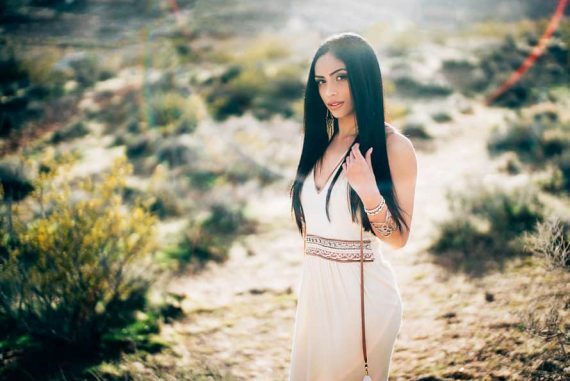 Anyone skilled with Lightroom should be using the Selective Adjustment tools – things like the Gradient Filter, Circular Filter and Adjustment Brushes are all key elements in the editing workflow. Being able to ‘dodge and burn’ a photo with your finger tip is like being a kid again, painting with your fingers! It’s fun and much more intuitive than using a mouse. If you’re got an Apple Pencil or similar stylus, the whole Selective Adjustment experience is taken to another level of precision. 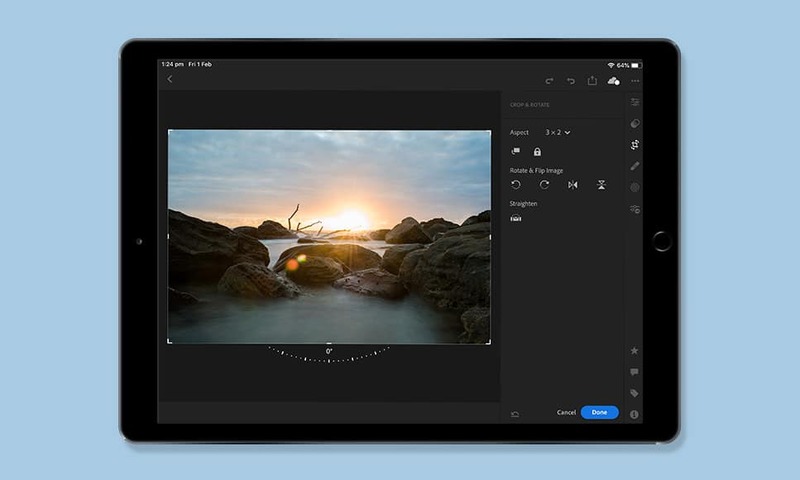 At the time of writing, these Selective Adjustment tools are only available on mobile devices when you subscribe to a Lightroom Creative Cloud plan. Typing a keyword in a huge catalog of images, displays relevant results in a split second. This impressive feature has huge potential – as it’s an Artificial Intelligence feature, the more it learns, the better it gets. Sensei Search gives you the ability to search through your catalog of photos using a keyword… even if you’ve never keyworded any of your images! If you’re lazy with keywording like I am (i.e. I’ve never keyworded a single photo! ), this is a god-send – being able to find photos in seconds that are hidden away in an enormous catalog is a real time-saver. 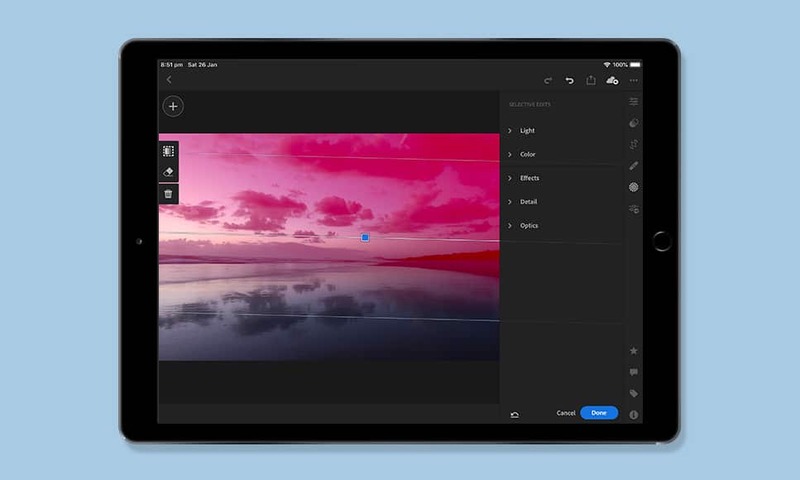 Straightening a horizon is one tap away with the powerful Geometry tool. The ability to straighten horizons and warped buildings with one tap of the finger can be really useful. The auto Geometry features are particularly useful – one tap and Lightroom guesses what should be straight… and usually gets it spot on. If you forget to shoot a landscape with a camera tripod, you can accurately level out your image with one tap of the finger during your edits using the unlocked version of Lightroom CC. Comments left on web galleries are synced back in to Lightroom CC. Using the paid version of Lightroom CC, you can create a shareable web gallery of your chosen photos in just a few seconds – much easier than the Gallery feature in Lightroom Classic CC. When you share your gallery link, viewers can comment on your photos. The best bit is that all those comments appear back in Lightroom on all your devices – you can even reply to the comments directly from Lightroom! Another really cool feature is that you’re able to edit the gallery photos on any computer – even one that doesn’t have Lightroom installed! You can show someone images in a private Lightroom gallery on their computer, then perform edits right there in the gallery, regardless of whether they actually have Lightroom installed! For pros, this is a great option for client proofing – editing in real time on the client’s device is a really impressive (and useful) feature. Using the built in Profiles is a quick & easy way to edit in Lightroom CC. Lightroom CC isn’t a complicated app to use, but it does feature some powerful tools to make the most of your images. Here are some of my favourite editing tips – I’ll be adding to this list as more features become available. Two finger tap to display photo metadata. Tap an picture to edit it. Click the flag icon with a tick in it (bottom left) to toggle between Stars & Flags for Rating. Flick your finger up or down on a photo in the main view to Rate. Tap and hold a photo to view a ‘Before’ editing version. Any time you want to sync your edits with your other devices, tap the cloud icon located at the top right of the screen. Double click on a slider’s ‘adjustment button to reset it to zero. Turn on ‘Offline Editing’ to increase the speed – this forces Smart Previews to download to your device. Now you can edit without a Wifi connection. Enable ‘Professional’ mode from the camera app in Lightroom, then enable DNG as the file format for more dynamic range while editing. Log in at lightroom.adobe.com with your Adobe ID to view your own online version of Lightroom CC. You can now organise, edit and share as if you were on your home computer. Encourage friends/clients to add comments in your shared albums – these become viewable in the app itself, where you can even post replies. Double tap any editing slider to move up or down in small increments. Turn on ‘Enable Auto Import’ – this means that next time you connect a camera to your mobile device, any photo imported into the Camera Roll will automatically appear in Lightroom CC too. When a menu is visible, you can drag it to the left or right to free up more screen space. 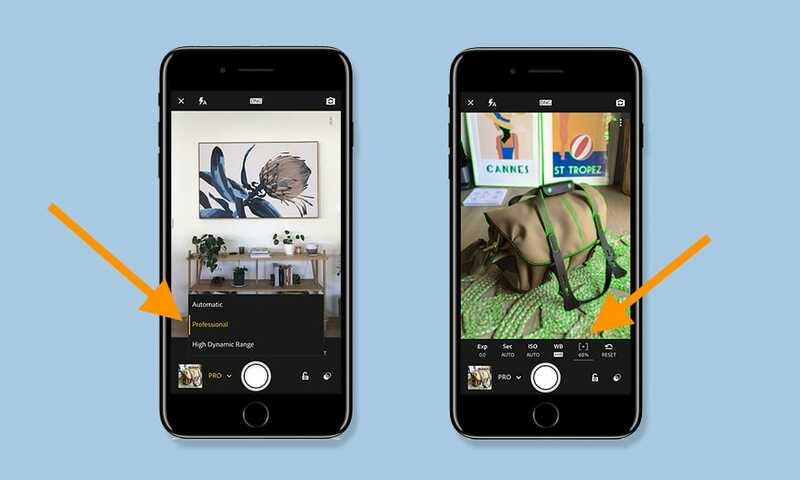 Take advantage of edit-syncing – switch to the photo to which you want to apply eedits, then tap the ‘Previous’ button to copy and apply the edits from the previous photo. As you play around with the sliders and effects in Lightroom CC, you’ll come across simple ways to make your photos look even better. Being able to do all this on a tablet or phone in your free time is a lot more enjoyable than clicking away behind a desk on your main computer. 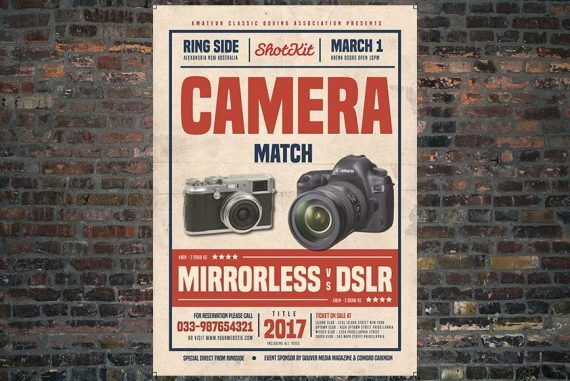 It’s a fresh opportunity to have an experiment with your photos. Presets are one of the huge advantages to editing photos using Lightroom. Being able to add a ‘look’ to your photos with one click is a huge time-saver. It’s easy to create your own presets from within Lightroom CC on your computer or mobile device, but importing your existing presets into your mobile or tablet via Lightroom CC isn’t immediaely obvious. 2. In the Import dialog that appears, browse to the required path and select profiles or presets that you want to import and click import. Here are some great free Lightroom Classic CC presets that you can use in Lightroom for mobile too. One thing to note: as of Feb 2019, it’s currently not possible to import photos directly into a mobile device and have presets automatically applied. In order to achieve this, you must import all your files to your main computer (with your relevant preset applied on import), then transfer the images to your mobile device. I’m confident this will change in a forthcoming update. ‘Professional’ mode enables some amazing features such as focus peaking. It’s a shame that the camera function in Lightroom CC is often overlooked, since it’s much better than the default camera found on most phones and tablets. I must admit, I never really saw the point in using the Lightroom CC camera over my regular iPhone one… until I noticed the Professional shooting mode. Once enabled, you’re able to shoot in DNG format (a RAW format that’s far superior to JPEG), use Exposure Compensation, manual focus, focus peaking, and several other features I never thought possible with a mobile phone! The Lightroom camera is available in the free version of the Lighroom app (available for iOS here and Android here), so I recommend you download it and have a play around. 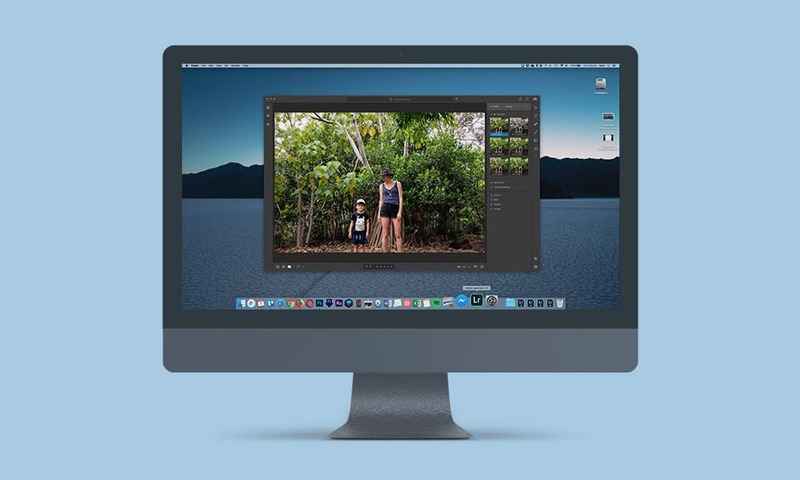 USB-C offers exciting new ways to import your photos into Lightroom CC. There are several ways to import your photo and video files into Lightroom CC. Most exciting for us photographers is the opportunity to import photos directly from your camera to your mobile phone or tablet, for a truly mobile workflow. This allows us to travel easier, or simply become unchained from our desks when editing, organising and sharing our new photos. This is the option I use when I’m on my main computer and want to transfer multiple files to my iPad or iPhone quickly. Click ‘Get Started With Lightroom CC’ in the upper-left corner of the screen, and make sure you’re signed in with your Adobe ID. Make sure that the ‘Sync with Lightroom CC’ option is turned on. Then click the greyed out bi-directional arrow next to any of your existing Collections to make them sync. To stop it from syncing, simply click the arrow again. Click the + icon in the upper-left corner to add photos from your hard drive. 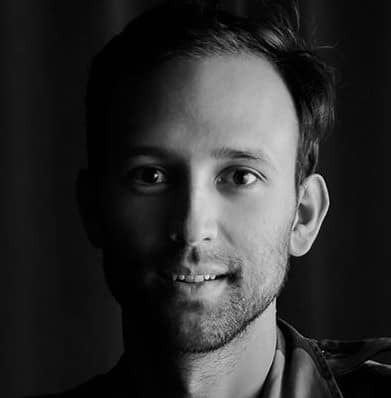 You can also connect a camera (or phone) to your computer and import your images. Using a Lightening to SD Card Camera Reader, you can import your photos directly to your phone or tablet. Make sure to turn on the ‘Auto Add from Camera Roll’ setting in the Lightroom CC Import settings on your mobile device. Then when you insert your card reader into your phone, you can choose which photos you want to import straight into Lightroom CC. As long as you have a subscription to Lightroom, you’ll be able to import your RAW files for editing. If you have a camera and a tablet with a USB-C connection, you can use a USB-C to USB-C cable to transfer your photos straight from your camera to Lightroom CC! 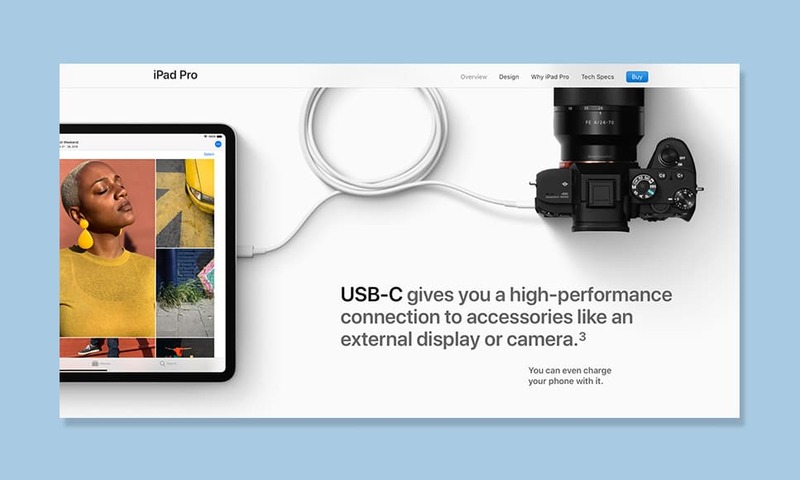 Currently, only the iPad Pro and certain mirrorless cameras support USB-C, but we can expect to see the format become more and more widespread in 2019. Again, as long as you have a subscription to Lightroom, you’ll be able to import your RAW files into your mobile device for editing. As I mentioned before in this guide, we really do live in exciting times as photographers here in 2019. It’s incredible we can now import photos from a camera straight into a phone or tablet, then use all the same powerful editing features as on our main computer. 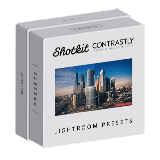 The premium features of Lightroom CC allow us to take full advantage of this opportunity. Being able to view, organise, edit and share all your photos from anywhere is incredibly liberating. Despite the confusing naming convention, Adobe Lightroom CC has emerged to be an absolute game-changer for all level of photographer. What was once a somewhat crippled application has been transformed via regular updates into an essential tool for organising, editing and sharing photos, both for amateur and professional photographers alike. While the free version of the Lightroom App does offer some useful and fun features, I highly recommend you invest in one of the Adobe Creative Cloud plans to unlock the various Premium Features. After all, it’s within the Premium Features where the true power of Lightroom CC lies. First, thank you for this article. It’s a great overview that provides a framework for better understanding the interrelationships of the programs and the hardware. Now,questions. I have the photography plan with 20 gb of storage from adobe. But also have 2 TB of icloud storage for our iphones. I have not been able to figure out how the iphone photos and the icloud storage relates to the adobe storage and the LR programs. If I delete a photo from my iphone, does it get deleted from everywhere. What if deleted from LR cc. If it’s saved in LR classic cc, can it be deleted from the other locations. Can my available icloud storage be used to preclude filling up the adobe storage. Hi John. Thanks for the kind words – I’m glad you find the article helpful. As for your question, the iCloud storage is unrelated to the Adobe photo storage. Anything in the Photos app of your iPhone is separate to anything in the Lightroom app (on your phone). If you export photos from the Lightroom app on your phone into the Photos app (still on your phone! ), this may count against your iCloud storage. 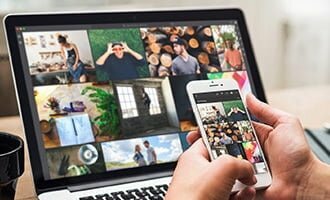 Whatever you delete from your Photos app, won’t affect what’s in Lightroom on your phone or on you computer. Does that answer your question? Mark, thank you so much for your reply. I think that it provides the key for me. I have been approaching the apple world and the adobe world as one big interconnected “blob”, and have not been using the iPhone Lightroom Cc camera function. Your words “unrelated” and”separate” change the approach from “blob” to two separate worlds where I set up and control the interfaces. Sometimes a simple shift in perception can make a big difference in understanding something. Your reply has done that for me. Many thanks. Ah glad to hear that, John. 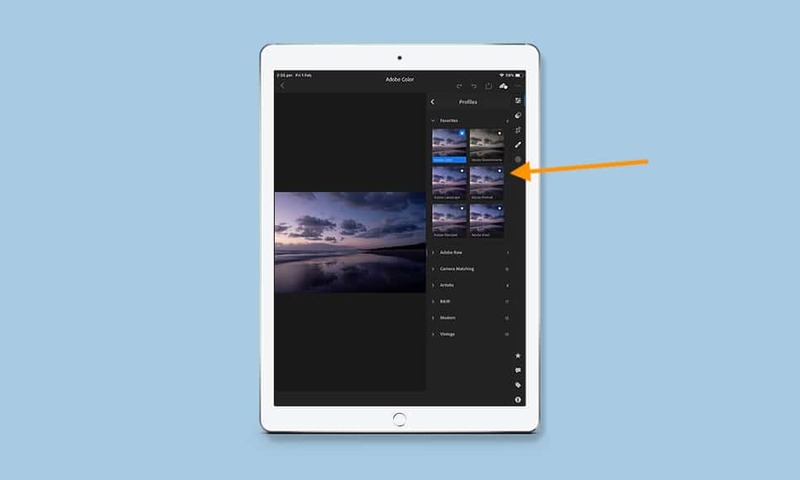 I agree – it’s not immediately obvious, especially due to the occasional overlap between the Photos app and the Lightroom Mobile app! 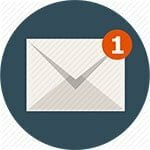 All the best, and feel free to post any other questions you have here. Ah thanks for the kind words Dave, and glad you agree with me! i’ve a question. i usuaaly add photos to CC via classic cc. and it always adds smart priview. then, i edit it via my phone. and save it. it saves small version. is there a way to save full resolution by this way? Hi Ozan, thanks for the kind words. Since v2.2.0, you are able to output in full resolution, but only on images you’ve captured or added to your device (i.e. images shot on the device or added via a a Card Reader or wireless transfer). Smart Previews are 2560 pixels on the long edge, so you’re limited to this on images synced from Lr CC to your devices. Does that make sense? it makes sense. thank you. one more question. to get the photos to iphone via card reader, first I add the photos to camera roll. in camera roll it shows me the jpeg however, it also keeps raw as I understand. and then when I open lightroom and add these photos, raw formats are added. I couldn’t find I way to directly add the photos to lightroom. There’s a setting in Lightroom mobile that allows for automatic import to Lightroom (bypassing the initial Camera Roll screen). Give that a try! Very recently got an Adobe Subscription with the 20 GB storage. I am a very amateur photographer. So my question is using Lightroom classic on my PC-have to as I am running Win 7 not the Win 10 needed to run CC Cloud. So my question is can I run CC Cloud on my IPhone with 12.3 and have it do everything you have talked about with having Classic on my PC? Or is everything’s dependent upon running CC Cloud on both my PC and my mobile device? Great question – you may be able to help answer it yourself, Steve (if I’ve understood correctly!) 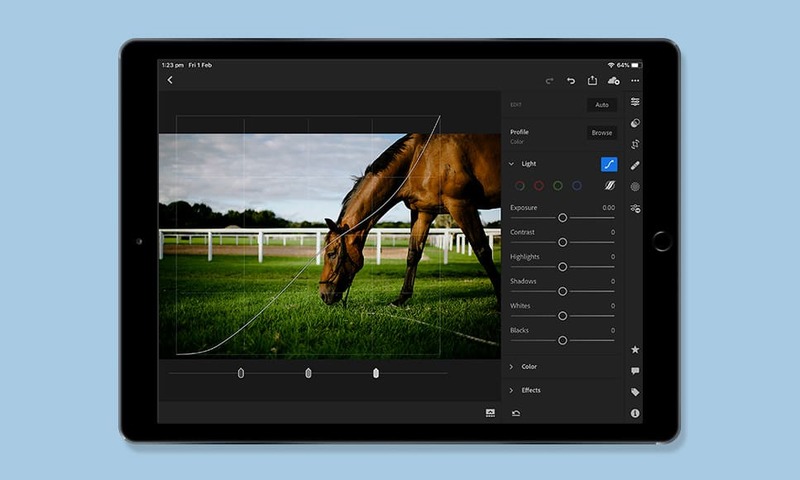 – do the premium editing features appear for you in your mobile version of Lightroom? Re. the syncing options, I’m pretty sure you need CC on your computer for the syncing features to work well, but you should be able to check that too – let me know.